Walk maker molds allow you to lay out attractive stone patios, concrete walkways, cobbled driveways and garden paths, an inexpensive alternative to purchasing expensive paver stones (Source). All of the walk makers we examined are random-pattern, with the exception being the Quikrete square/rectangle European block walk maker (Source). Buyers advise to purchase more than one of these walker maker molds at a time to make the job go easier- laying out multiple molds at a time. Depending on your climate, drying time can be up to 20 minutes, so you don't want to be waiting around for the concrete to set before you can continue your work (Source). Home owners also advise to purchase/rent a concrete mixer rather than doing it by hand- manual-mixing can become incredibly grueling (Source). Buyers also advise using Quikrete crack-resistant concrete- by far, the best results have been reported from employing this brand of concrete mix. Producing 'turns' in a walkway path is another common challenge- it's best to watch some instructional guides online prior to attempting it (Source). You can also add coloring to the cement mix, too, but always 'over-darken' it, because once it dries it will be considerably lighter. You'll want to spray the walk maker down after every 4 uses to ensure concrete doesn't dry on it (Source). One DIY-yer told us he added mortar mix to the cement to enhance traction on his finished patio. Some say that a sand/gravel base is not required, that all you need to ensure is that the groudn is level, pitch and compact. This country stone pattern walk maker is a Chinese-made option designed to create attractive patios, court yards, and walks. All you need to do is fill the mold with a concrete mix, smooth the surface and then remove mold. One buyer we spoke with said that he used three 80-pound bags of cement per 4 squares, mixing in about 3.5 quarts of water per bag. As well, you should spray down the walk maker form after every couple of uses- this helps it release easier. It's best to ease the form out of the ground, rather than just lifting it up vertically- it helps prevent sticking cement. You can also create partial, or single, cobbles by selectively pouring the concrete using a halved gallon jug. As we previously mentioned- if you have a large project to do, you'll want to rent a cement mixer rather than hand-mixing the concrete. This walk maker offered by Quikrete Companies is easy to use, handy, and suitable for creating cobblestones paths in your garden. Users love the simple design, but some do note that the mold is manufactured in China. 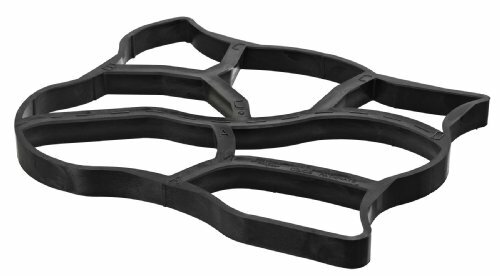 The Quikrete path form measures 24” x 4.2” x 1.8”, and it features a weight of 4.3 pounds, unique design, and plastic construction. To use it you simply have to fill the form with 80 lbs of concrete mix, and it’s perfect for patios and courtyards. The Quikrete form is reusable which is great because you can use it on multiple DIY projects. A buyer comments that he bought several of these walk makers and that they are light and easy to handle. He states that he used the molds to make a driveway and that he was very pleased with the achieved patterns. Another user mentions that the path form is very well-made and that he has been using it for several projects with no issues. He adds that it took him three months to finish a large project, and the result was magnificent. A reviewer also highly recommends the Quikrete walk makers as the best option for cobblestone paths, and he observes that the mold is thick and sturdy. However, some customers have complained that the Quikrete mold is overpriced and that it’s messy to use it. Some users also noted that an 80 lb bag of concrete was too much and they advise that you use a 60 lb mix. 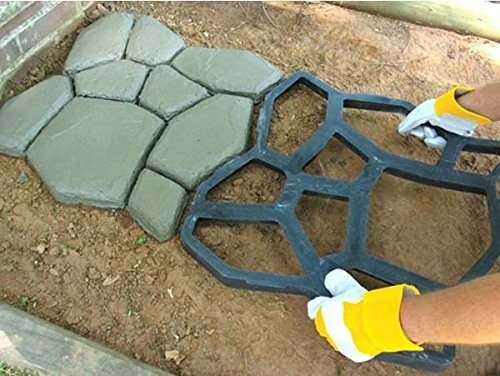 If you are wondering how to make a uniquely patterned garden path, you might take a look at this DIY wall maker offered by Wovte. Users love that the form is light and easy to use, but some do note that it’s expensive. 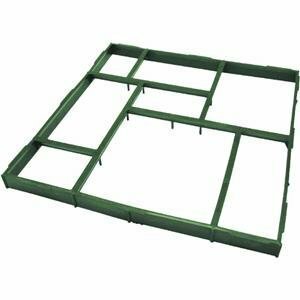 The concrete paving mold measures 17.12” x 17.12” x 1.57”, and it features heavy-duty, plastic construction. To use this form you need only premixed concrete, and since it’s reusable, you can use it over and over again. Another great thing Wovte walk maker is that you just have to spray it with a garden hose to clean it. A customer mentions that her husband is very pleased with the design and functionality of the Wovte concrete from and that you need to wait only five minutes before removing the mold. She adds that it’s a child’s play to use the walk maker and that it took her husband three days to finish a large section of their yard. Another reviewer shares that 60 lb of concrete are enough to fill the form, and he advises that you spray the walk maker with Pam every time to achieve smooth edges. A user also states that the plastic is thick, durable, and light, so your hands won’t get tired quickly. However, one customer has complained that the walk maker is smaller than he expected and that the provided instructions were not in English. This concrete path form offered by Kenley is well-made, durable, handy and suitable for making straight edges, curves, and angles. Users love the price and the patterns, but some do note that it’s small. 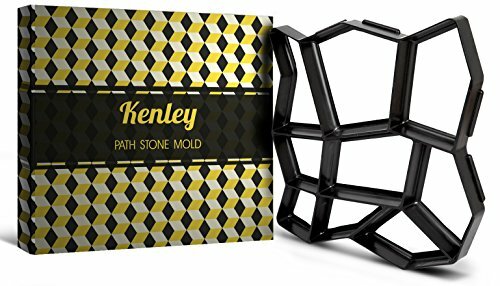 The Kenley original path maker measures 17” x 17” x 1.6”, and it features a weight of 2.9 pounds, 9-stone patterns for patios and driveways, and a PP resin construction. The mold is easy to clean, takes little space to store which is great if you have limited storage space, and you don’t need any special skills to use it. Overall, this is the ideal choice for any DIY gardener. In general, customers are extremely satisfied with the achieved results, and they don’t have any major complaints regarding the performance and functionality of the Kenly walk maker. A reviewer shares that you need 80 lb of cement to make four steps and that the mold is easy to use. He highly recommends it to every DIY fan as the best walk maker. Another user mentions that the mold is thick, sturdy and that it comes with easy to follow instructions. The buyer adds that the form is perfect for backyard patios and stone driveways and that even the most unhandy person could use this path mold. He advises that you watch some YouTube videos to get the hang out of it. A purchaser also states that the Kenley mold is made of quality material and that it works perfectly. If you are searching for a way to make a stone path quickly, you might consider this walk maker offered by Quikrete. Users love the quality of the mold, but some do note that the form arrived damaged. A purchaser shares that the Quikrete European walk maker is easy to use, ideal for small-scale projects and that it saves him a lot of time. But he advises that you clean the form after each use. Another buyer comments that he made a 15-feet path using this mold and that he was very impressed with the final result. He adds that he finished far quickly than he expected and that the walk maker is easy to clean afterward. A reviewer also states that the concrete path form works exceptionally well and that he made a 400 ft patio with it without encountering any issues. He highly recommends it as the best walk maker available. However, some customers have complained that the Quikrete mold is heavy and that it’s tiresome to use it for a prolonged time. Some users also note that it’s not very easy to smooth the edges and that the plastic is not very durable. This random path maker offered by Scepter is light, well-made, and an excellent choice for curved paths. Users love the random patterns, but some do note that it’s overpriced. The Scepter random form measures 16” x 16” x 1.5”, and it features a weight of two pounds which is great because you won’t get tired quickly, and durable, plastic construction. The stone path mold is reusable, and you only need a concrete mixer and a trowel to make your own unique pathways or patios. Another great feature of the Scepter stone mold is the design which allows you to create a continuous path in any direction and make turns and curves. In general, users are extremely satisfied with the functionality and usefulness of the Pathmate random stone mold. A buyer comments that he made a 16 ft path very quickly and that you need to wait only two minutes before removing the frame. He also says that the form is sturdy and light, and he recommends that you buy two for convenience. Another reviewer mentions that the plastic is sturdy but flexible and that it’s ideal for DIY projects. A user adds that he has been using the Scepter stone mold form for months and that he is very impressed with the heavy-duty quality and the beautiful results. 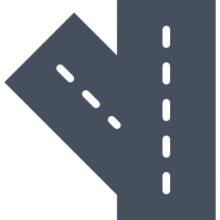 However, some customers have complained that it’s not very easy to use the random path for and that it’s hard to maneuver. Some users also note that it’s smaller than they expected. The first stepping stone mold we examine is manufactured by Quikrete- it's a Chinese made walker maker designed to build out patios, walks and courtyards. All you need to do is fill the mold in with a concrete mix, smooth surface, and then remove the walker maker mold. Contractors say, in terms of how long you should leave the walk maker in place before removing it, that it takes less than thirty seconds after you used a trowel to smooth the surface for the concrete to then set. Another buyer advised us that you don't need to have a sand/gravel base- all you need to do is lay out the walker maker mold on a level ground, and then once it is completely set, you'll want to sweep all of the fine grain sand into its crevices and hose it down with a misting spray. You'll want to fill-in any gaps and crevices between the stones with sand and use some black weed block prior to laying in the concrete to ensure that weeds don't become a nuisance. One buyer told us that if you have a large project to do, it makes sense to purchase a bunch of these walker makers and use them in conjunction to get the job done easier and faster. A professional contractor told us that after all of the concrete has set, it's a good idea to do some pressure washing on the finished stone patio and apply some semi-transparent stain. Reviewers say that while the instructions suggest you use 2.5 quarts of water per concrete back, buyers say that you'll want to modify that, likely diluting it a little bit further to make it easier and smoother to work with the concrete. Another reviewer advises that instead of lifting the entire walker maker mold up at once, that instead you should lift one side at a time to prevent concrete from sticking to it. As well, if you only want to use one square section of the mold, you can add the concrete just to that using a small carton like a coffee can. Another buyer told us how he had constructed a 45 foot front walkway to his suburban home, saying that it was somewhat challenging to build a turn into his walkway, but it ended up being worth the extra work and planning. Indeed, do it yourself homeowners say that it can be quite grueling to lay out these molds, with one purchaser saying that on average he completed about four of them in a single session, and at most did no more than 10 a day on his own. If you have a dual-width walkway that you are building, you might want to check out some YouTube videos if you need to build a turn into it as a reviewer said the instructions for accomplishing that were somewhat convoluted. The second concrete walk maker we examined is manufactured by Wovte it's a plastic mold indicated for the design of patterned paths, patios and walks, ideal for both amateur and professionals to perform backyard landscaping. Indeed, one of the advantages of building out a stone walkway passing your garden is that stepping stones help protect the health of your flowers and plants from yourself and guests in your home who unaware can trod down seedlings. The way they work, you'll want to prepare the ground service, lay out the concrete garden mold and then your poor in the premixed concrete into it, trowel it smooth. Some advice from the manufacturer includes spraying the molds after use of the concrete doesn't dry. One reviewer says that in order to stain their concrete walks, they mix the powder color in with the cement, saying that you want to mix it darker than your preference because it will certainly lighten later. Another home remodeler advised new purchasers to rent a concrete mixer if they are working on a large project, because hand-mixing cement can become an incredibly grueling process. Many buyers recommend spraying the form with Pam prior to setting, though there is mixed feedback regarding whether that actually works or not- you'll just have to experiment on your own. Home rehab pros tell us that about 60 pounds of concrete is indicated to fill up this particular stepping stone mold, with many buyers opting to paint it with stain and seal it after it has finished drying. The third pathmaker mold we examined is manufactured by Kenley, it is the paver walk maker mold. It features a nine stone pattern designed for the construction of the decorative driveways, walkways and garden patio paths, with curves, angles and straight edges built into the mold. The manufacturers say that you don't actually need to lubricate the mold prior to pouring in cement, in contradiction to other reviewers who have ceaselessly advised that that is the case. Reviewers say that it output beautiful cement stone patios, a cheaper alternative than purchasing paving stones- plus you can actually add colored pigment to give them an especially attractive appearance. The fourth option we examined is the Quikrete square and rectangle shaped walk maker. One buyer purchased several of these so that he could get the job done faster, saying that it took about 20 minutes, based on his regional climate, to remove the mold- so having multiple walk makers on hand made everything go faster. Reviewers say that in general it is a little bit tricky to build paving stones around existing posts- but that is generic to walk makers not to this one specifically. Another homeowner told us that a sand and gravel base is not required, but the ground should be compact and level- and you should expect that an 80-pound bag will do a little bit more than one mold. As well, you should spray off the molds with WD-40 after you've done four of them and expect that in terms of coloring you can apply half a bottle for every 80-pound bag. 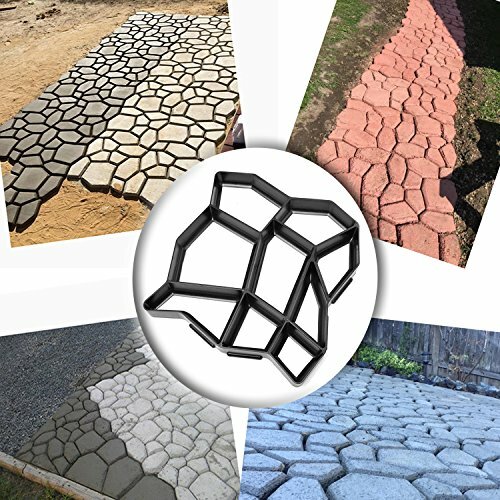 Another reviewer recommended purchasing a pair of these paver molds at a time, using crack-resistant concrete, wearing protective sunscreen while you're out doing the job, opting for extra water to create better-molded concrete, and renting concrete mixing equipment rather than doing it by hand. The last reusable concrete walk mold we examined is the Scepter Pathmate mold. It supplies a random pattern engineered to allow contractors and amateurs alike the ability to quickly layout attractive-looking pathways, ensuring random designs for curved walkway paths. One reviewer told us that they added coloring and mortar mix so that the finished patio would have enhanced traction- and even supplemented with some glass beads for a sparkling appearance. This is an especially original form, with some buyers underlying chicken wire to ensure the stones don't shift around over time.